Our rich Chocolate Thumbprint cookies are made from scratch when you place your order. Each cookie is rolled by hand and then filled with our signature chocolate. Handcrafted from my Irish grandmother's recipe, these cookies are sure to be a hit for any special occasion. We use only the finest ingredients and make all our products by hand in small batches. Approx. 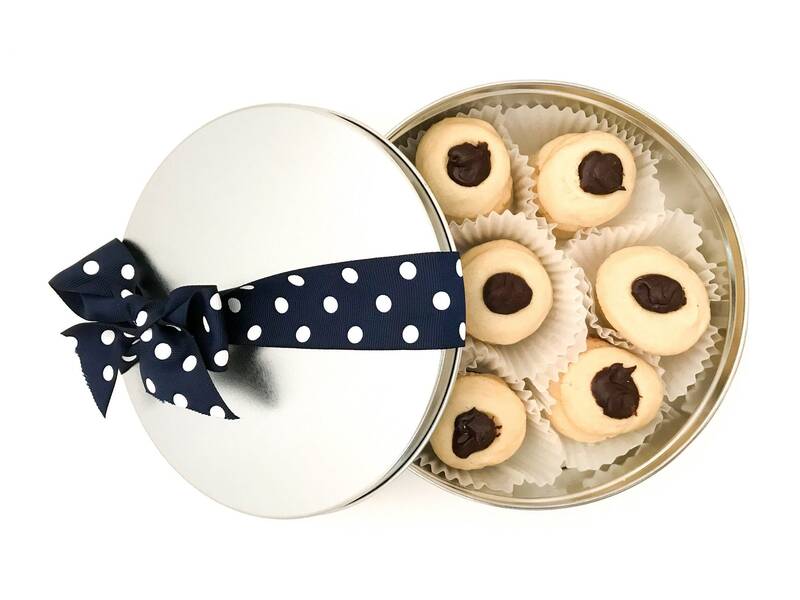 18 Thumbprint cookies (about 11 oz) in 7 3/16" diameter cookie tin. Wonderful! My second time ordering from you and I look forward to ordering them again! Wow! cookies were amazing, my friends LOVED it. Quick and easy too. Seller was very responsive. Highly recommend!!! I sent these as a gift to a family member who has everything. They loved the cookies. They said they were both beautiful and delicious and were a big hit. I would say this is a perfect gift for just about anyone. Gift giving made easy!